Matudnila.com - A Cebu Events Blog: Cebu's 8 Kilometer Extreme Running, Run to the Clouds on March 21! Home Triathlon Cebu's 8 Kilometer Extreme Running, Run to the Clouds on March 21! 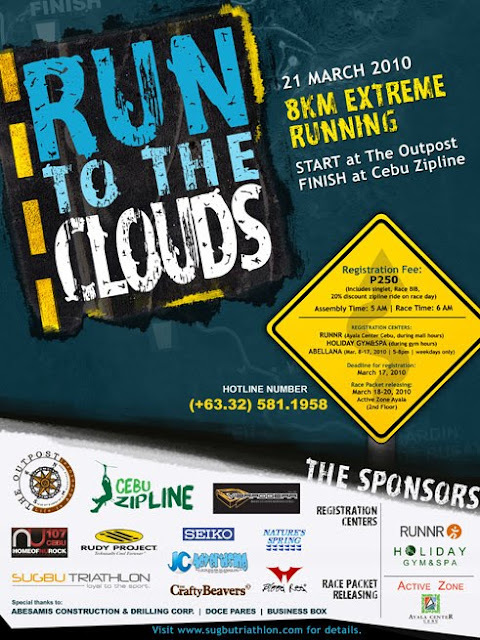 Cebu's 8 Kilometer Extreme Running, Run to the Clouds on March 21! Start at The Outpost, Finish at the Zipline. The 8-Kilometer Exteme Running this 21st of March 2010. Prices: 1st P3000, medal and Rudy Project eye wear; 2nd P2000, medal and Blood Red gift item; 3rd P1000, medal and Blood Red gift item and 4-10th medal. Registration at Holiday Gym&Spa is only up to March 15 while you can register in RUNNR and Abellana until March 17. Participants is limited to 1,000 runners on a first-come-first served basis. The first 700 runners to register are assured of their singlets during race packet releasing while the remaining 300 will only receive their race numbers. Singlets for the last 300 registrants can be claimed after the event at Business Box, Ayala on April 5-10, 2010 (4-8PM). Race packet releasing schedule is on March 18-19 (4-8PM) and March 20 (10AM-8PM) at the second floor of Active Zone, Ayala. Interactive Route Map and OFFICIAL ENTRY FORM can be viewed and download here. Run to the Clouds 8K Exteme Running posted at Cebu Events Blog. 0 comments: on "Cebu's 8 Kilometer Extreme Running, Run to the Clouds on March 21!"